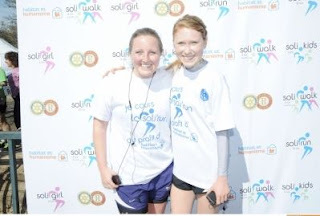 Sunday, my roommate, dear friend and fellow Rotary Ambassadorial Scholar, Allysan, and I ran a 10K, sponsored by the Rotary Club of Concord with proceeds benefiting Habitat for Humanity. With my upcoming trip to Portugal as a member of a Habitat team and recent participation in the semi-Marathon de Paris- it was an ideal occasion to participate. Plus, spring has FINALLY sprung in Paris, and Sunday was one of the most beautiful (20 degree Celsius and sunny) days I have had in my time here! With both of us finishing under an hour... I think this spring weather has energized us in seen and unseen ways!